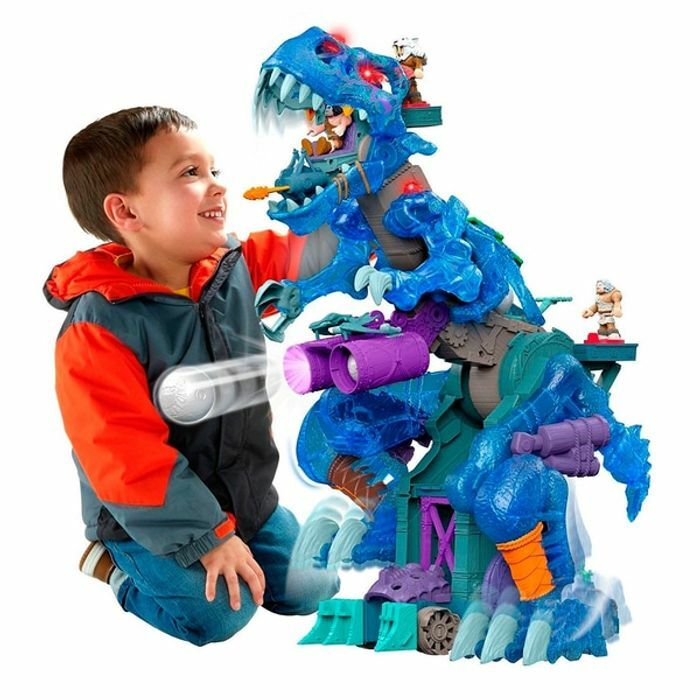 Your little dino lover’s imagination gets a gigantic boost from the Imaginext Ultra Ice Dino, with 3 Power Pads to bring him roaring to life. Turn the Power Pad behind his tail and he starts walking. A turn of the Power Pad above his left hip allows him to stand to his full height of 2 ½ feet tall — and activates the LED lights in his spikes and his eyes. And when you turn the third Power Pad, his mouth opens and closes with awesome chomping sound effects — and even fires arrows! If that isn’t enough to scare away enemies, he has two ice boulder launchers in his chest and back that can be fired at the push of a button — and a projectile claw! With realistic sound effects while he’s walking, standing and firing projectiles, this huge dino makes no bones about it. Turn the Power Pad above his left hip to raise him to his full height of 2 ½ feet — and make the LEDs in his spikes and eyes light up! Turn the third Power Pad to open and close his mouth — and fire projectiles! Press lever to fire his projectile claw!